Vedic Prophecies have long held that the Sun has a 'dark companion' and the Bible Code, written about 3200 years ago not only contains references to it (along with comet/asteroid impacts) but even refers to it by the name Vulcan. Madam Blavatsky even refers to how its presence astrologically influences avatars like Christ and Buddha. But there have been more recent references to this dark companion, those from extra-terrestrial aliens sources. Dr. J. Allen Hynek (Astronomer) seems to think that some of these alien contact reports were valid. Civilian scientific consultant to the U.S. Air Force (1948/49-1969) i.e. 20 years. He began as a debunker of UFO sightings, however he discovered there was what he felt were a significant percentage of these reports which he could not explain. He became convinced they deserved further study by the scientific community. Perhaps this was one that caught Hynek's attention. Figure 1. Extra-terrestrial Alien Description Of Our Alphabet And Solar System. A well circulated, but unpublished, case occurred on 6 Oct. 1974. The individual was invited on-board a saucer. Figure 1 is his description of their interpretation of our alphabet and a description of our solar system. Common human planetary symbols were employed by the aliens, but they may have been deduced years before. The first three alien symbols (12 V) translates to G2V. The Sun's recognized astronomical characterization is that of a G2 main sequence spectral class (V) star. 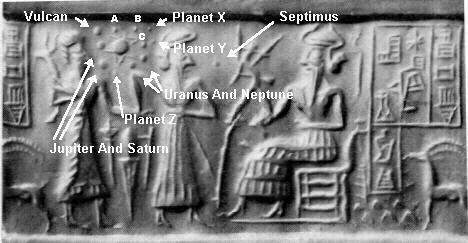 Three other solar objects are indicated, one above and one below the string of planets and a final one at the end. Two (* and phi) appear out of the ecliptic plane. One of these may be Eris whose inclined orbit indicates that it (and 2000 CR105) are 'captured' objects. The I symbol denotes a super-giant star, but if the Invitee failed to notice a V (i.e. VI) a sub-dwarf star is indicated (incorrectly associated with brown dwarf stars, but perhaps the only designation available to the aliens). The Invitee was told that the asteroids (Maldek) resulted from an exploded planet, a view since popularized by a Naval Observatory astronomer. Figure 2. Locations Of Pioneer And Voyager Space Probes. Figure 2 shows that the Voyager probes (launched 1977) bracket an object (a Brown Dwarf?) roughly located by the Pioneer probes (launched 1972 - 73). See Figure 3. Table 1 shows one of the first reported IRAS (Infrared Astronomical Survey) Satellite objects, IRAS 1732+239, in this direction. Pioneer 10 5.057 hrs 25.83 deg. 89 AU 77.20 deg. 3.01 deg. Pioneer 11 18.596 hrs -8.57 deg. 70 AU 279.06 deg. 14.59 deg. Voyager 1 17.076 hrs 12.13 deg. 97 AU 253.35 deg. 34.78 deg. IRAS 1732+239 17.5476 hrs 23.9433 deg. 448** AU 260.78 deg. 47.17 deg. Voyager 2 19.680 hrs -52.26 deg. 78 AU 287.50 deg. -30.35 deg. Figure 3. A Brown Dwarf In Our Solar System Suggested In Nov. 1982 Science Digest. 5. A DISTANT JOVIAN SIZED OBJECT DISCOVERED - BLAVATSKY'S VULCAN? Figure 4. 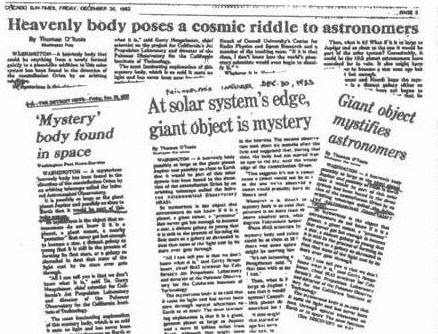 1982 - 1983 NEWS Reports A Jovian Sized Object Discovered 50 Billion Miles Away. 0358+223 03:58:02.8 22:18:00 84"X30" 0.68/1.5/44 Dis. Galx. 0404+101 04:04:44.7 10:11:52 66"X30" 0.56/4.2/26 Faint Galx. 0413+122 04:13:37.3 12:17:36 64"X30" 2.20/3.4/55 Triple Galx. 0422+009 04:22:54.0 00:56:06 38"X30" 0.68/3.0/31 Poss. Galx. 0425-012 04:25:21.1 - 01;14;50 66"X30" 0.75/2.0/39 Galx. Object 1732+239, found by the Infrared Astronomical Survey Satellite (IRAS), is believed to be the object sought by the the Pioneer and Voyager space probes. Orbital Eccentricity 0.537 +0.088/-0.035 +/- 0.0085 not cal. Argument Of Perihelion 257.8o +6.11o/-13.47o +/- 0.90o not cal. Time of Aphelion (years) 1970 AD +/- 1.0 +/- 1.0 not cal. Table 3 shows Vulcan's orbital parameters. Vulcan's Aphelion is 41.6 billion miles (448 AU) vs. Hynek's 50 billion. Forbes (1880) used comets aphelia to predict a similar planet's orbit. Stars pass within 2000 AU of the Sun over the solar system's life and would eject planets more distant than 47 billion miles (500 AU). Figure 5. The 4500 Year Old Akkadian Seal. Note The Indicated Sizes Of The Jovians And The Sun. Figure 5 shows the Akkadian seal. Figure 6 shows a mathematical fit of the Sun and Jovian's diameters as measured from the 4500 year old Akkadian seal vs. their known masses. It clearly shows that the 'ancients' were aware of their relative size (by extra-terrestrial alien contact?). 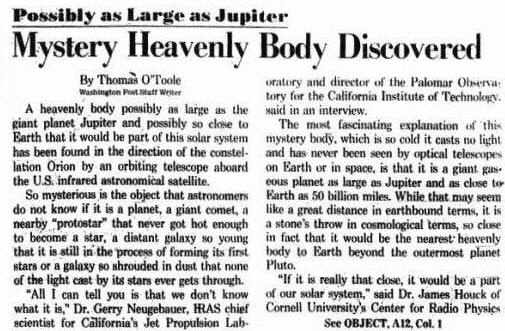 It also implies that there is another Jupiter like body in our solar system (our Vulcan), 141 +/-35 Earth masses in size. 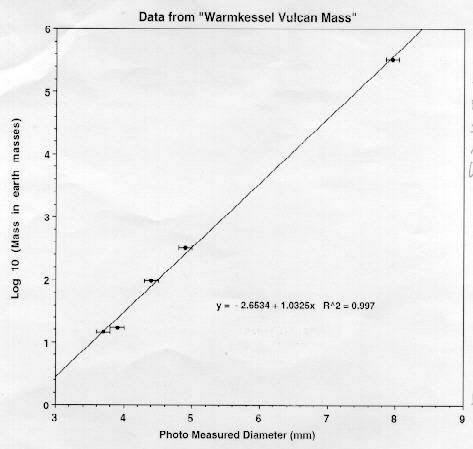 Similar size estimates for Vulcan can be deduced from actual TOI (time of perihelion) of the more definable comet clusters Vulcan generates (yielding a 0.05% Solar mass - 166 Earth mass - Vulcan) and from a suspected alien generated crop circle (yielding about two thirds of the original 0.105% solar mass estimate or 237 Earth masses. Figure 6. A Mathematical Fit Of The Diameters Of The Jovians And The Sun Against The Logarithm Of Their Masses. Figure 7. Vulcan Draws In Kuiper Belt Comets From That Fragment Into Swarms Rounding The Sun. Figure 7 shows these Vulcan related swarms. They are labeled A' & A and B' & B respectively. A rogue swarm C is also present. Their periods (~3313 years) are about are two thirds that of Vulcan's, but vary slightly due to Vulcan's distant presence. The 3:2 resonate orbit means that the comets orbit the Sun three times every time Vulcan orbits it twice. Thus, for an interval of every three comet revolutions, or two Vulcan revolutions, the celestial geometry modifying the periods of the distant comet swarms is the same as before. This interval is theoretically 9938 years, two times Vulcan's theoretical 4969 year period. Table 4 illustrates that Earth has been the victim of many impacts in the recent past. Major comet/meteorite impacts cause significant weather changes and cause the collapse of civilizations. The most notable events are Noah's Great Flood (~3195 BC) and the Atlantis disaster (~9,703 BC). The comets/meteorites may not be visible until they hit the atmosphere as their volatile ices may have been cooked away during their many passes around the Sun. Comet impact generated climate changes offer indirect evidence that verify Vulcan's theoretical period when the 3:2 resonance effect is considered. An interval of two theoretical Vulcan (4969 year) periods is required to maintain the same celestial geometry otherwise Vulcan's gravitational force slightly changes the comet swarm's period. The 9938 year interval has been measured to be accurate to within a year for two A Swarm Cluster 1 (A:Cl-1) impact events spaced two Vulcan periods apart. The measured value was found to be exactly 9939 +/- 20 years. However, the second event was a minor one as the major bolloid appears to have hit during the earlier event. A similar value of 9919 +/- 32 years is measured for the B:Cl-2 cluster that initiated the Younger Dryas period. Indirect evidence is also available from giant comet 2000 CR105's average orbital period. CR105 is a member of the exclusive Extended Scattered Disk club containing only a few distant objects whose perihelion's are too far away from Neptune to be influenced by it. Unlike the Earth threatening comets, CR105 is a virgin comet whose motion is never influenced by the known planets. CR105 offers the elusive astronomical evidence that reveals Vulcan's existence and this is tantamount to discovering Vulcan. Including Vulcan's mass and orbit in the solar system, CR105's average period is 3319.3 years (3316.7 years without Vulcan). Multiplying by 3/2 gives Vulcan's period of 4979.0 years, ten years off the theoretical 4969 year value. Moreover, other scatter disk objects, like 2001 FP185 (3433.7 years) and 2002 GB332 (3234.2 years), appear to be in a similar 3:2 resonance and 1999 DP8 (1246 years) in a 4:1 resonance with Vulcan. It is statistically certain that these intervals/periods are in the predicted resonant relationship with Vulcan's orbital period. The probability that CR105's orbital period is associated with Vulcan's theoretical period in a resonate relationship is 77% - 83%. The same probability for the A:Cl-1 impact events is 97% and for the B:Cl-2 events is ~57%. The B Swarm clusters are multiple and a little confusing. Any probability > 40% means that the two physical quantities are related. B':Cl-1 237 - 278 - Small Strikes 1680 - 1700 AD? 1464 A:Cl-2 300 - Dark Ages Start Two-stage event after Comet of 531 AD Exploded Near The Sun. 3582 ? - - Joshua Impact Event 1582 BC? C:Cl-1 149 - Sodom/Gomorrah sulfur found - 2195 BC? A:Cl-1 383 - Younger Dryas Exit? exact ice core data. 9,703 BC Atlantis impact event, Younger Dryas Exit? 12220 A':Cl-? - - Younger Dryas Event? Humans became sentient about 55,655 to 55,680 BC near an Ice Age thermal minimum. Then it got colder. The climate did not begin to warm up until 15,000 years ago. Sir Fred Hoyle, Britain's royal astronomer said: "The next ice age is not specific problem of the distant future. Besides wiping out a considerable fraction of those now alive, it would leave a wan, grey future from which the survivors and their descendants could do nothing to escape." He proposed that meteors (or comets) strikes are responsible for both the rapid onset and termination of Ice Ages as well as the variations of global ice levels found in the Pleistocene. The climatic change data provided by the Center for Ice and Climate, offers data showing at least five major weather changes about ten thousand years ago. These are thought to be associated with the B swarm that threatens Earth this century. If these comet clusters remain potent weather changers, the odds are that that a significant weather changing event will occur in the next six years, or before the close of 2015. The 8 October 2009 Indonesian 10 meters meteor exploding in air with the force of 50,000 tons of TNT could be the first major strikes from the returning first cluster of the B-swarm. Significant weather changes have appeared since October 2009. A major impact can cause the collapse of civilization as we know it. 11. AN ALIEN WARNING OF AN IMPACT THREAT? Figure 8 contains an image of Crop Circle T367. 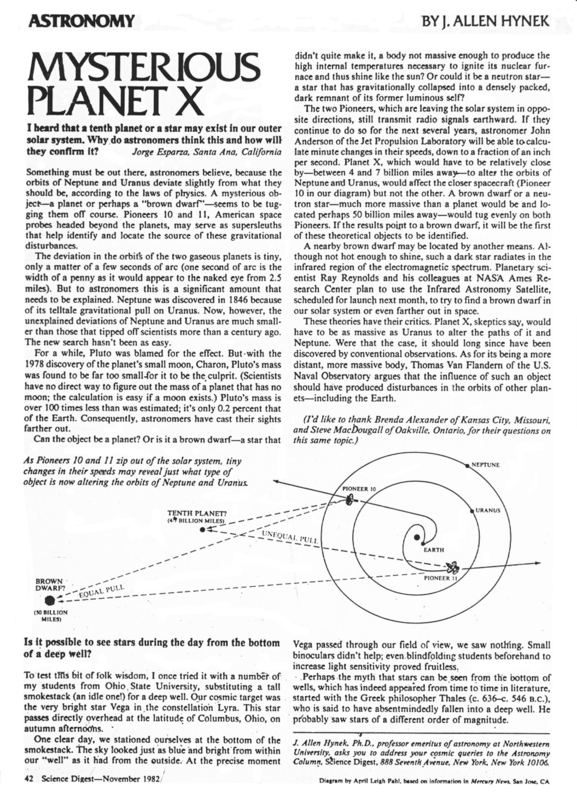 Note that the planets depict a planetary positions that seem to relate to late February 2007 and that the Earth appears missing from its orbit seeming implying that it will be destroyed (impacted by one of the objects labeled 2 - 5; comets?). It is interesting that in this crop circle, the Sun is offset from a cleared central region. The offset is in the opposite direction of IRAS 1732+239. Considering Vulcan to be near aphelion, 448 AU, simple mathematical projection implies it is about half the mass of Jupiter. Vulcan's high inclination is not alluded to here implying that this crop circle is to be considered a 'cartoon' and not a 'photograph' of the physical situation. #1 IMPACT THREAT: 07/05/ +/- 6 days. #3 IMPACT THREAT: 09/09/ +/- 6 days. ? The WISE Infra-red comet and asteroid detector was launched in December 2009. This Infrared Space Telescope "is really good at finding the darkest asteroids and comets" like "dark asteroids that may be former comets that have long since had all the ice vaporized from their exteriors, leaving them with inactive surfaces that no longer shed dust to produce tails." It will be active until late October 2010, when the mission is slated to end. The space telescope is expected to complete its first all-sky map survey during the first six months of its mission. It can track and warn of meteors and comets that could threaten Earth between July 2010 through the October 2010, just the interval warned of by crop circle T367. The WISE dark comet detecting satellite runs out of coolant by October. Its broad field search ends by July. The dark comets will be warmed by the Sun for 5 months before they threaten Earth increase their visibility. Figure 8. 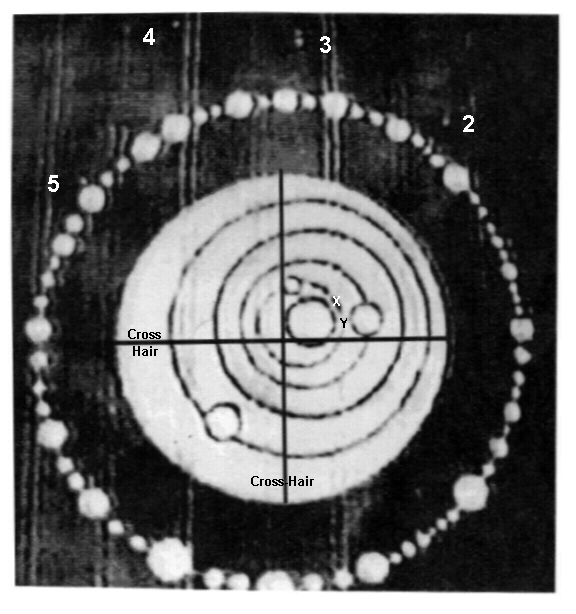 Crop Circle T367 - The Solar System - Indicates Four Threatening Impact Times.